Bioreactors and fermenters are used for creating proper environment for the growth of microorganisms or driving biochemically active substances derived from such organisms. Fermenters are basically utilized for the growth and maintenance of a population of bacterial or fungal cells in a controlled mode. Bioreactors, the large sized fermenters, are widely used in biopharmaceutical industry for the production of biologics such as monoclonal antibodies, recombinant proteins, and vaccines at a large scale. In the past few years, the process of large-scale bio-manufacturing has become more practical owing to advancements in technology and the easy availability of machines large enough to produce significantly high volumes of biologics due to progress in expression systems, cell lines, and cultures. These advancements have boosted the requirement for equipment as demand for small volume and multi-product capabilities have enabled facilities to adjust unit operations based on demand without incurring wastages and additional expenses. According to Transparency Market Research, the global bioreactors and fermenters market is projected to reach US$4461.0 mn in 2024 at a CAGR of 12.2% from 2016 to 2024. In terms of product type, the market for bioreactors and fermenters has been segmented in the report into single-use bioreactors and multiple-use bioreactors. Of these, the segment of single-use bioreactors are gaining more popularity than multiple-use bioreactors as the former ones offer benefits such as lower capital expenditure, smaller footprint, quick assembly, and reduction in the risk of cross contamination. Demand for single-use bioreactors is expected to further rise as cost pressures from the health care providers increase and new markets open. This would require a level of flexibility and speed in construction, which is not possible with conventional bioreactors. However, the segment of multiple-use bioreactors is presently the leading contributor of revenue to the global market, accounting for a massive 59% of the overall market in 2016. The well-established segment will continue to lead the global market and grow at a promising pace, albeit at a lower growth rate as compared to the segment of single-use bioreactors. 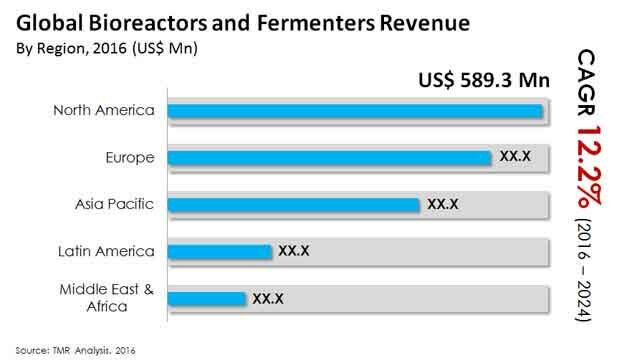 From a geographical standpoint, developed regions North America and Europe commanded a clear dominance in the global bioreactors and fermenters market in2015, collectively accounting for a nearly 62% of the global market. North America led the market in the said year, a feat chiefly attributable to the vast technological advancements achieved in the field of bioprocessing systems and the increased adoption of single-use disposable bioreactors. The North America marker for bioreactors and fermenters also has a strong hold on the global market owing to the presence of several biopharmaceutical companies and bioprocessing equipment manufacturers. Native companies such as Thermo Fischer Scientific Inc, GE Healthcare and Danaher Corporation have fuelled the demand for the bioreactors and fermenters in the region and are considered to keep the demand for bioreactors and fermenters strong in the next few years. Over the report’s forecast period, however, the Asia Pacific market for bioreactors and fermenters is expected to be the market with the most promising growth rate. With several factors working in its favor, such as strengthening economies and funds being poured in by international biopharmaceutical companies and contract manufacturers aiming to exploit the vast growth opportunities that the region has to offer, the Asia Pacific market is likely to register a 14.3% CAGR from 2016 to 2024. The rising prevalence of chronic diseases and the resultant rise in demand for biologics are also driving the market for bioreactors and fermenters in Asia Pacific. Some of the leading players operational in the global market for bioreactors and fermenters are Finesse Solutions, Inc., Applikon Biotechnology B.V., PBS Biotech, Inc., Danaher Corporation, Sartorius AG, Eppendorf AG, ZETA Holding GmbH, GE Healthcare, Solaris Biotechnology srl, PIERRE GUERIN TECHNOLOGIES, Thermo Fisher Scientific Inc and Merck KGaA. Popular business growth strategies employed by players in the market include strategic acquisitions and collaborations and other activities aimed at expanding their global footprint.